Weebly is being offered as an independent site building platform through Weebly.com. This is a free hosting platform and Weebly does not charge you for hosting your websites. This is applicable for all users from the lowest free plan to the highest performance plan. The success story of Weebly made lot of paid hosting companies to offer Weebly site builder to their users. This is on paid basis either as a white labeled solution like SiteGround offers or a branded Weebly builder offered by Bluehost. We have used both of these options for years and here is our thought on what might be a good fit for your need. We do not see any hosting company offers Weebly as a single dedicated service. The major focus of hosting companies is the open source packages like WordPress, Joomla and Drupal while Weebly is being offered as an additional option. On paid hosting, you need to sign up and subscribe to one of the premium hosting plans to host your Weebly sites. The basic shared hosting plans will start somewhere from $3 to $10 per month and the cost will go up based on your further needs. 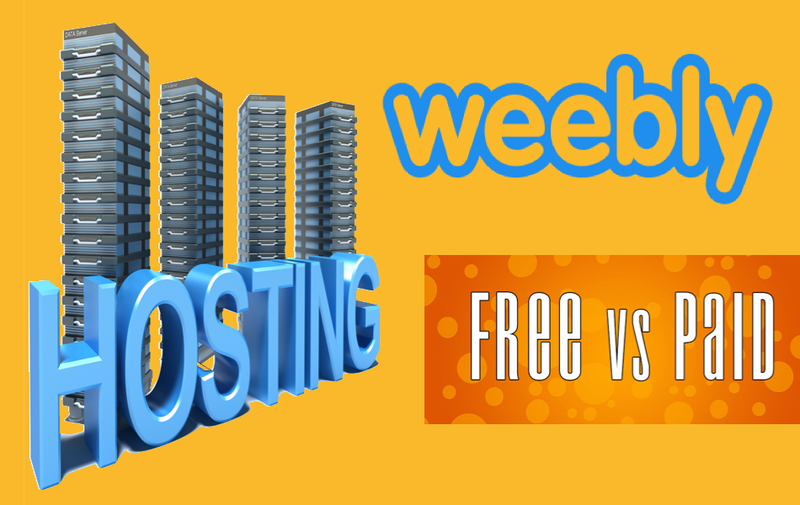 After getting a hosting account, you will ONLY get free Weebly plan. This essentially means the money you pay for the hosting is in addition to what you need to pay for getting premium Weebly services. All hosting plans come with one year free domain offer. So this will be a saving for you compared to buying a separate domain and opening a Weebly account. The biggest advantage of paid hosting is that you can have multiple sites on different platforms. For example, your main site can be on WordPress and you can showcase some portfolio or demos on Weebly site with starter plan. This helps to leverage the available facilities and distribute your server load to different domains (even sub-domain will help in this case). This is a feasible task for agencies and webmasters providing services. But for individual site owners, maintaining different sites on different platforms is a difficult task. For WordPress site, you should use WordPress admin panel and for Weebly you should use the hosting account. This will be a cumbersome task if both the sites are linked heavily. Backup is one of the real concerns with free hosting providers like Weebly. Free Weebly platform allows users to backup the zip archive of the HTML content. Unfortunately blog posts and products can’t be backed up to local devices. Also the archived content pages can’t be restored with single click. So basically the backup is of no use for you other than keeping the HTML content on your local device. The situation is no better with paid hosting. As blog posts and products are directly stored in Weebly’s database there is no way to backup those content locally even with paid hosting. Getting support – whether you are using paid hosting or free hosting, the support at site level should be availed only through Weebly support team. Latest Weebly version – as far as we have checked none of the hosting companies offer the latest site builder and premium plans as offered through Weebly.com. It may take very long time for the hosting companies to get the latest versions, which is also not guaranteed. So if you like any particular option from Weebly.com then checkout it is available with hosting company before buying. Editing options – we also understand some of the hosting companies don’t allow users to edit the source HTML / CSS like Weebly.com. This is of really no use in our opinion. Weebly dashboard – on paid hosting, you will not see the dashboard. So you need to directly work with the editor and will not have the functionalities offered through the dashboard. There is no possibility to migrate from paid hosting to free version and vice versa. When you are planning to build a large scale site then Weebly is not an option being it a free of paid hosting. If you have smaller site then Weebly.com with free hosting can suffice most of your needs. On other hand if you want to run multiple sites on different platforms then paid hosting will help you manage everything in one place.